Standing in a sunny courtyard of the India Habitat Centre in New Delhi, I am surrounded by a sea of delegates streaming into day one of the global symposium, Men and Boys for Gender Justice. Organized by MenEngage, an international network of nearly 700 NGOs operating on every continent, it is day one of a symposium that has attracted more than 1000 people from 93 countries. I am one, a member of the North American MenEngage Network (NAMEN). I feast on the rainbow of color as a parade of delegates dashikis and saris, Nehru shirts and sports jackets passes by. How many languages did I hear “good morning” spoken in? An additional objective concentrates on involving youth and addressing their concerns. Violence – including gender based violence and discrimination across the life cycle, harmful practices, sexual violence, violence against children, among men, and suicide. I am overcome with emotion as I sit here in the media room with colleagues chatting as they type, eating lunch any fan of Indian food would drool over. The work I joined so many years ago at the Men’s Resource Center in Amherst, Massachusetts, has blossomed into an international movement. At a breakout session this morning, I listened to men and women from Uganda, Swaziland, and Sudan share their vision of and for whole men, doggedly confronting tightly held cultural stereotypes aimed at undermining men’s involvement in caregiving, housework, challenging sexually risky behavior, standing up to fight against domestic and sexual violence. 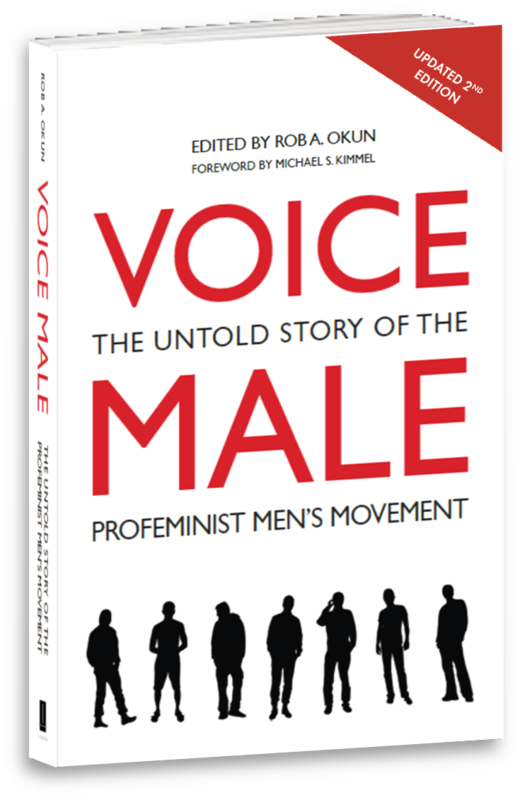 That 2000 copies of Voice Male magazine were printed here in Delhi–and a copy included in the colorful cotton tote bags we all received this morning–means the work begun at home in Massachusetts in the 1980s is contributing to “the great turning”–the sea change in men’s lives so many have been yearning for. We are stepping forward, men, women, transgender. We are holding hands and holding on. We are a movement on the move. We are you. We all have a stake in creating a world where the words gender justice become reality.